COMPASSION: The treacherous journey back to Nebraska was an extreme test of wills. However, Standing Bear was driven by compassion for his now dead son, and the desire to fulfill his final wish. Before he was arrested, he and nearly thirty other Ponca people endured extreme blizzards, prairie winds, and near-starvation in the journey home to their native lands. COLLABORATION: A woman named Susette LaFlesche was Standing Bear’s interpreter in court. LaFlesche was an accomplished and educated doctor and reformer, known as the first person of Native American heritage to earn a medical degree. RESPECT: Standing Bear respected the professionals who helped him after his arrest. His relationship with the Nebraska journalist, Thomas Tibbles, was essential in helping him share his story with the nation and gain support for his cause. CELEBRATION: The strong legacy of Standing Bear’s actions inspired the people of Nebraska to name many monuments, parks, and natural landmarks in celebration of his bravery. Winning the right for Habeas Corpus for Native Americans. Challenging the notion of personhood under US Law. Chief Standing Bear was born in 1829 to the Ponca, or Mantcunanjin tribe. His tribe lived in an area that the United States government called the Indian Territory, which was the land designated for native people during settlement. This was strange for Standing Bear’s tribe and others, because they had been living on these lands for as long as they could remember, much longer than European settlers had been in the country. The Indian Territory started out as very large, but over time, it shrunk to include only the areas that are now called Kansas, Nebraska, and Oklahoma. Chief Standing Bear lived in what is now the state of Nebraska. During his childhood, his tribe relied on raising maize, or corn, along with other vegetables and fruits. They also also hunted local bison and fished for food. Standing Bear spent his youth learning these skills from his elders so that he could take his place in the tribe one day. In 1859, things began to change rapidly. The United States government passed the Kansas-Nebraska Act, which forced the Ponca tribe to move the state of Kansas. The government approved plans to build a transcontinental railroad in order to bring more white settlers to the area and expand the United States’ territory. As white settlers grew in large numbers, there was little land left for native people, who were used to having the right to live, hunt, forage, and grow food freely. Standing Bear’s tribe did not want to live on the new land they had been assigned. They wanted the right to practice their traditions and gather their food on the land they were used to, with better soil and familiar rivers, valleys, and other landmarks. The Ponca Tribe did not know the native plants, animals, and seasons of the new land on which they were forced to live; this made it extremely difficult for them to survive. They also believed in being buried with their ancestors, which was impossible now that they were not legally allowed off the reservation, or the area in which they were assigned to live by the United States government. If they left the reservation, they would be arrested. Standing Bear knew these actions were unjust. The conditions of the reservation were abysmal. Many Ponca people died, due to lack of food and shelter. Disease spread quickly. When Standing Bear’s son died from malaria, he decided he would take action. His son’s last wish was to be buried alongside his ancestors. So, Standing Bear and several other tribe members embarked on a journey back to his ancestral land in Nebraska, carrying the bones of his son with him. They marched hundreds of miles during the winter attempting to bring his bones back. The Army arrested Standing Bear because he did not have permission to be off the reservation. 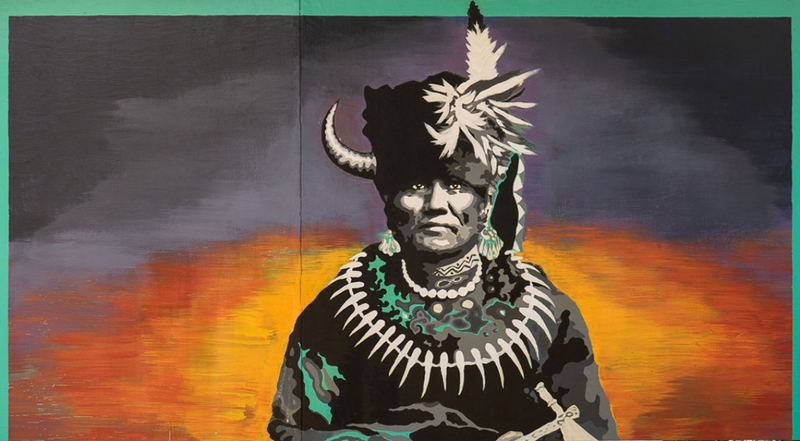 In a country that was striving to grant its people the “unalienable rights” of life, liberty, and happiness – it was clear to Standing Bear that, in the eyes of the law, he and his people were not considered human. Around the time of Standing Bear’s arrest, a journalist from Omaha became interested in his story. The journalist helped gain the attention of three lawyers, who offered to help Chief Standing Bear sue the United States government. The problem was that, at that time, Native American were not technically considered citizens, and therefore they were not given the right of habeas corpus, that is, the right to defend themselves in court. This meant that, before Standing Bear could even argue his case, he had to first prove he deserved the rights that most Americans already had. Even though he did not speak English, Chief Standing Bear found the courage to win habeas corpus. He argued his case in front of an all-white judge and court. He successfully helped the court understand how treating a Native American differently than a white person was unjust. The judge ruled in Standing Bear’s favor, tribe legal rights of United States citizens – but there was a catch. They had to let go of their tribal membership, and they were not allowed to set foot on another Native American reservation. Even though Standing Bear won his case, he had a lot of work left to do. He toured the country as a public speaker to share his story with the rest of the country. He continued to educate the nation about the treatment of Native Americans, while advocating for full recognition under the law. Because of Standing Bear’s efforts, members of the Ponca tribe were paid thousands of dollars in restitution, or funds to make up for damage. However, the tribe was now scattered throughout the midwest. Things never returned to the way it was before settlers separated families and divided the land. The United States government granted Standing Bear a few hundred acres of land in Nebraska. He died in 1908, joining the son who inspired his movement. CCSS.ELA-LITERACY.W.9-10.3: Write narratives to develop real or imagined experiences or events using effective technique, well-chosen details, and well-structured event sequences. CCSS.ELA-LITERACY.W.9-10.3.A: Engage and orient the reader by setting out a problem, situation, or observation, establishing one or multiple point(s) of view, and introducing a narrator and/or characters; create a smooth progression of experiences or events. CCSS.ELA-LITERACY.W.9-10.3.B: Use narrative techniques, such as dialogue, pacing, description, reflection, and multiple plot lines, to develop experiences, events, and/or characters. CCSS.ELA-LITERACY.W.9-10.3.C: Use a variety of techniques to sequence events so that they build on one another to create a coherent whole. Objective: Students will identify narrative techniques used to develop create experiences and evoke pathos. They will discuss the relevance of these techniques when enacting social change. Finally, they will utilize such techniques, along with those of self-expression, to write narratives that develop real or imagined experiences. Now return to the concept of restitution, or reparations as we now call it today. Tell students: Remember, the United States government paid the Ponca tribe money and granted them land in order to make up for the damage that had been done by its policies. Today, the idea of restitutions, or reparations, is still being discussed. Read students the Ta-Nehisi Coates’s biography before showing the YouTube video. Bio: Ta-Nehisi Paul Coates was born September 30, 1975 in Baltimore, Maryland. He is an American author, journalist, and comic book writer. Coates is a national correspondent for the well-known newspaper, The Atlantic. He writes about cultural, social and political issues, particularly those regarding African Americans. He is well known for writing The Case for Reparations, which outlines, through personal stories, the history of systematic and institutionalized obstruction of access to wealth, land and opportunities for African Americans since the time of slavery. What do Ta-Nehisi Coates and Chief Standing Bear have in common? Coates says he wants to write “in such a way that makes people feel things.” What do you think he means by that? Why is it important for public speakers to make people feel things? What is the difference between making people feel hope and being honest? If you were a public speaker, how would you evoke hope and be honest? Show students the following speech by Kandi Mossett, a contemporary native activist. How does Kandi Mossett’s speech “make people feel things,” as Coates tries to do? How is Kandi Mossett’s speech hopeful? How is it honest? What does Kandi’s story have in common with Chief Standing Bear’s? Have students think of a cause they care about. Tell them to imagine they have chosen to embark on a public relations tour. Their upcoming tour can involve a series of press strategies - newspaper articles, YouTube videos, rap songs, conference appearances, or more. They may be creative! Have them develop a journal from the perspective of a public speaker. They can imagine they are themselves, or an invented public speaker. Write the journal in first person. How does the issue directly affect you, and how are you planning on getting the public to care about it? Chief Standing Bear was motivated by a deep spiritual call to honor his son’s memory. This motivation was strong enough to help him, even in brutal cold and miserable conditions. What is your personal motivation that inspires you to create change for your community? How do you take care of yourself while on your public speaking tour? Write about their food, their exercise, the time they spend with friends and family, etc. What keeps them energized and healthy so they can keep going? Remember - personal journals are where you can write about the mundane things, so don’t be afraid to write about regular, everyday life. What does it feel like to be on a stage? Are you excited, nervous, grateful? How do you work through your nerves?